Vallivue School District wants you to be aware of procedures as we move into this winter season. 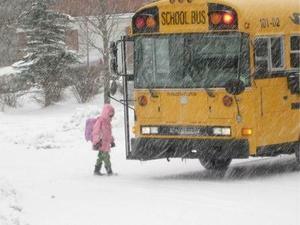 The district will relay messages about closures and busing delays through Infinite Campus. Depending on your settings you may get a phone call, text, or email message. Be sure to update your information on the Infinite Campus Portal so you get the messages. While we strive for timeliness, buses do inevitably get caught in winter weather traffic. Please prepare your student(s) for the possibility of buses being late. Please make sure your student(s) is dressed appropriately. Here are some tips to better prepare. As always have student(s) wear bright colors. Have student(s) wear layers of loose-fitting, lightweight, warm clothing. Be sure hats and/or hoods do not obstruct the student(s) ability to hear and see traffic. Cover student(s) mouth to protect his/her lungs from extreme cold. Have student(s) wear shoes with good traction. Use the restroom before getting on the bus! Plan ahead for any medical needs your student may have on the bus. Please remind students not to pick and throw snow while waiting at the bus stop.